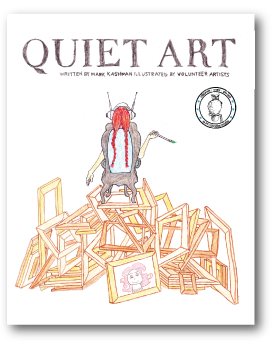 Quiet Art is the story of a little girl, Wilda, and her persistent efforts to use art to communicate with the noisy, impatient world around her. Everyone is telling her to be "quiet!" and she must learn, with support from her Grandma Gert, to express herself and use the power of her own imagination to rebuild trust, faith and family. Irv's StoryTime partnered with Foster The Future, the charity initiative of the band Foster The People to bring awareness to art and have fun collaborating with fans and do gooders across North America. 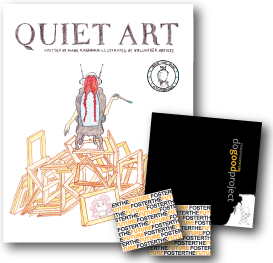 Along the band's 2012 North American tour, Irv gathered illustrations from artists of all ages to create a collaborative book called Quiet Art with the cover illustrated by Foster The People drummer, Mark Pontius. 70% of net profit will benefit Arts Education Partnership.